The Horizon sleeps 14 and is 15x56 ft with 4 staterooms. The reverse floor plan is perfect for enjoying the lake because the living area faces the lake and not the red bank. It has 1 full bath downstairs and a 1/2 bath upstairs. 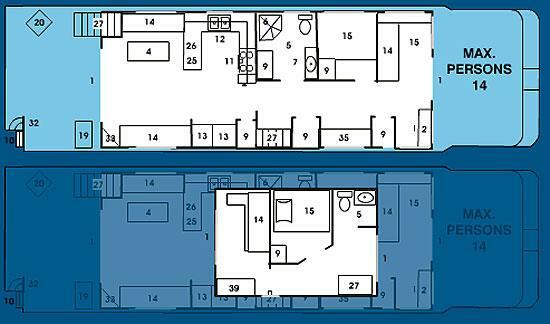 All of the usual amenities plus many more including self tracking satellite TV, trash compactor, dishwasher, inverter, interior and exterior stairs to top deck, and all the comforts of home.